Recently "Priyanka Chopra" revealed the poster of her upcoming Marathi film "Kay Re Rascala" on her twitter handle , saying, "Full steam ahead on @purplepebblepic's 2nd Marathi production #KaayReRascala – a hilarious family entertainer releasing July 14 @chopramm5". The poster released reveals the names of its two characters Raja and Guddu and tells us its release date set for July 14. It will be Priyanka Chopra's second marathi movie as a producer after the "National Award" winning film "Ventilator". 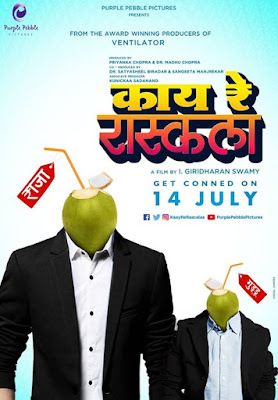 The upcoming film "Kaay Re Rascalaa" is a light hearted comedy movie with a blend of Maharashtrian and South Indian culture. The movie is directed by debutant 'Giridharan Swami' an cinematographer turned director. The movie stars "Gaurav Ghatnekar" and debutant "Bhagyashree Mote" in lead role. The cast also includes Supriya Pathare, Nikhil Ratnaparkhi, Akshar Kothari, Shrikant Mhase, Aishwarya Sunar, Nihar Gite and Nagesh Bhonsle.